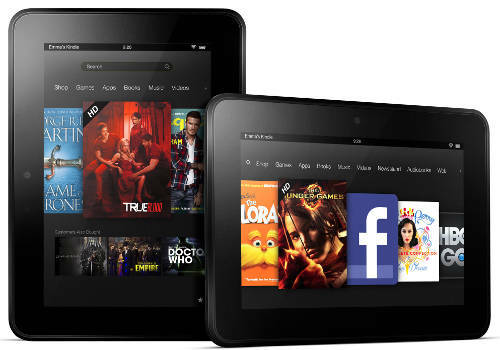 Below is a list of 40 tips, tricks, hidden features, and recommended apps for the Kindle Fire HD. There’s always a lot to learn when getting started with a new tablet, and these tips can help everyone from the beginner to the advanced user get more out of their Kindle Fire HD tablets. Feel free to share your own tips and recommended apps in the comments section too! Update: Check out this newer updated article for the 2014 Fire HD and HDX tablets: Fire HD and HDX: 50 Tips, Tricks & Recommended Apps. 2. Access Notifications and Settings Menu – The notifications menu is accessed by swiping down from the top of the screen. There are a number of quick settings here and the main settings menu is accessed by pressing the "More" button. 3. Install 3rd Party Apps – In order to install apps from outside the Amazon appstore, including several linked to below, you need to turn on "Allow Installation of Applications from Unknown sources" located in Settings > Device. 4. Automatic Screen Rotation – You can turn on and off automatic screen rotation by opening the notifications menu and tapping the locked/unlocked icon in the upper left corner. 5. Check Battery Percentage – Settings > Device. For a better and easier way see #30. 6. Check Storage Space – Settings > Device > Storage. 7. Parental Controls – In the settings menu there’s an option for parental controls where you can setup a password to restrict purchasing content, using the web browser, accessing certain apps, and more. 8. Password Protection – In Settings > Security there’s an option to set a lock screen password so that other people cannot access your Kindle. 9. Uninstalling Apps and Removing Content – Simply long-press on any app, ebook, movie, or other icon to bring up the option to "Remove from Device". For Amazon’s content this moves the item to the cloud and it won’t be deleted permanently. 10. Remove Items from Carrousel – Long-press icons for the option to remove them. 11. Favorites – Add individual apps, ebooks, movies, web pages, and so forth by long-pressing the icon and selecting to "Add to Favorites". These can be accessed at any time by pressing the star icon in the lower right. This works well for quickly jumping back and forth between different apps. 12. Free Daily Android App – Make sure to open your Kindle Fire’s appstore each day to download the free paid daily app. 13. Remove Ads – After logging into your Amazon account, go to the Manage Your Devices section of your Kindle account. From there you can choose to "Edit" the Special Offers to unsubscribe from them. It costs $15 plus tax. 14. Change Name in Upper Left Corner – To change the name that appears on the upper left corner of the Kindle Fire, login to your Amazon account and go to the Manage Your Devices page. From there you can edit the name to whatever you want. 15. Alternate Appstores – By enabling 3rd party app installs (#3), you can install apps from anywhere you please. Here’s a list on some of the more popular alternate appstores. 16. Sideloading Apps – Apps can be sideloaded in a number of ways. You can place the apk files on the Kindle’s internal memory and then use a file manager to locate and then tap the file to prompt install. Or you can use a file storage app like Dropbox. When using the web browser to download apps, simply tap the file once it is finished downloading to install. 17. Using Bluetooth – To use Bluetooth, first turn on your Bluetooth device. Then on the Kindle Fire HD go into Settings > Wireless > Bluetooth > Enable. Tap the device’s name to make it visible, then tap the Bluetooth device’s name you’re connecting once it pops up (or hit search for devices if it doesn’t show) and then it will be good to go. Unfortunately I’ve noticed that it often requires the Bluetooth device to be reconnected manually by tapping the device’s name again after the device has been turned off for a while. 18. Using the Camera – Download PicShop Lite Photo Editor from the Amazon appstore (it’s free, or you can upgrade to the paid version). Open the app, hit the icon in the lower left, then choose "Camera". Like the Google Nexus 7, the Kindle Fire HD has a front-facing camera but they neglected to give users a way to access it since they only intended it to be used for video chat. Update: see this post for a better way to access the hidden camera, which includes a video recording and panoramic option too. 19. Install Adobe Flash Player on Kindle Fire HD – Amazon isn’t supporting Adobe Flash on their tablets anymore but that doesn’t mean Flash doesn’t work. All you need to do to get Flash on the Kindle Fire HD is download a web browser from an alternate appstore (#15) and the Flash Player app below. I’m successfully using the Dolphin web browser (version 8.8.1) and this version of Flash Player. 20. File Manager – The Kindle Fire doesn’t come with any file management software, which can make things a lot easier if you need to move files or access folders you can’t normally get access to. My favorite is ES File Explorer, and it’s free in the Amazon appstore. Highly recommended. 21. Micro HDMI – The Kindle Fire HD has a micro HDMI port that works great for connecting to a TV or monitor. On Amazon, micro HDMI cables are only a few bucks. Or you can get an adaptor to fit a full size cable connector. Just make sure to get one with a "Micro" (Type D) connection to fit the Fire. 22. YouTube – You can access YouTube with the Silk web browser but the actual YouTube app is a lot better. I sideloaded the version from the Nexus 7 and it works great, even in HD. It just won’t let you login. Here’s the link: download YouTube apk. 23. Facebook – Here’s the link to the official Facebook app at Amazon. For some reason it gets buried under miles of search results when you try to find it from the KFHD. 24. Google Maps and Street View – Google Maps and Street View aren’t available on Amazon’s tablets, but they work just fine when you sideload them. Here are the download links: Google Maps and Street View. 25. Calculator – Every tablet should come with a calculator app pre-installed but for some reason Amazon doesn’t think that is necessary (I guess they don’t want you calculating how much money you are spending on their stuff). Luckily there are number of free calculator apps in the appstore. 26. Screen Dimming – When reading at night the lowest brightness setting isn’t low enough for some people, me included. With Screen Filter you can adjust the brightness of the screen to as dark as you want it. 27. Turn Off Notifications – Sometimes apps can get annoying with pestering notifications. Luckily Amazon added the option to turn off notifications for individual apps in Settings > Applications > Notification Settings. 28. PDF Reader Apps – If the Kindle’s PDF app isn’t cutting it, there are much better options out there. The best PDF apps available in the Amazon appstore are Adobe Reader, which is free, and ezPDF Reader and Repligo Reader for paid. If you want to sideload other PDF apps, here’s a list of the Best PDF Android apps both free and paid. 29. Read ePub eBooks on Kindle Fire HD – Amazon offers various ePub reading apps in their appstore, but they are mysteriously not available on the Kindle Fire. Luckily you can sideload other reading apps such as Nook, Kobo, and Aldiko. Here’s a list of ePub eReading apps for the Kindle Fire. 30. Battery Monitoring App – One way to monitor battery usage is with the GSam Battery Monitor. Another good thing about this app is that it shows the exact battery percentage in the notifications menu so you don’t have to go all the way into the settings menu to find it. 31. Silk Reader – The silk web browser has a feature that takes the content of a page and cleanly re-formats it. There are different text sizes and formatting options. Look for the green glasses icon located on the web browser tab. It only appears on article-type pages. 32. Cloud Storage – In addition to Amazon’s cloud drive, you can use other cloud storage options to easily save, stream, share, and move files. Two popular options that work well with the Kindle Fire are SugarSync and Dropbox. The former is available in the Amazon appstore and the latter can be downloaded from the link above. 33. Uploading Music – You can upload your personal music collection to Amazon’s cloud drive and stream it or download it to your tablet. Here’s the directions for uploading music. The first 250 songs are free, then you have to get a premium plan to add up to 250,000 more, which costs $24.99 per year. 34. Wireless Hard Drive – One way to expand the Kindle Fire HD’s limited storage space is to get a Kingston Wi-Drive. They come in three sizes: 16GB, 32GB, and 64GB. You’ll need the Kingston Android app too. 35. Select Text & Copy and Paste – When using the web browser and certain other apps, you can select and copy text by long-pressing on the word and then dragging the little arrows. To paste, long-press in any text entry field to bring up the option. You can also long-press on links and images with the browser to bring up saving, sharing, and other options. 36. Access a Computer Remotely – You can access your computer and all the files and programs on it directly from your Kindle Fire HD with the Splashtop Remote Android app. 37. Loading non-Amazon eBooks and Personal Documents – The fastest and easiest way to load non-Amazon ebooks and personal documents on to your Kindle Fire HD is to use a send to Kindle application or email them to the Kindle Fire’s free email address. The unique address can be found under Settings > My Account, and can be modified from the Manage Your Kindle page under personal documents settings. 38. Downloaded eBooks and PDFs – If you download a MOBI ebook or PDF with the web browser and want it to show up on the homescreen carrousel and in the personal documents section, you need to use a file manager (#20) to move the downloaded file from the “Download” folder to the “Documents” folder. It will show up once you leave the homescreen and then come back to it. 39. Free Library eBooks – The Kindle Fire HD supports library ebooks downloaded for free from your local library. You can use the Kindle option or install the OverDrive Android app. Nathan this is great info. I’m wanting to buy the kindle fire hd but i really need to be able to use the gmail video chat. Do you know if this is possible? My employer won’t let us download skype but we can check our email from gmail. I travel a lot and this is how I stay in contact with my family. Sorry but I didn’t know that Gmail even had video chat. Perhaps someone else will chime in that knows. Great review Nathan. I saw you had the Overdrive Media Console downloaded. How easy do you find downloading books from your library? Do you know if the library ebooks go directly into your download folder by default each time? It could be inconvenient if they do. Thanks! I haven’t actually tested out the OverDrive app on the Kindle Fire HD; I just wanted to make sure it installed and opened correctly before posting about it. I still prefer to read ebooks on an E Ink ereader. In fact I just loaded a couple of library ebooks onto my PRS-T2 since they make it so easy with the direct library downloads. What’s giving you the trouble, exactly? Both the links above for the Dolphin browser and Flash download are working, although I’ve noticed if you are downloading Flash directly to the Kindle Fire you need to hit the link twice at MediaFire because the first time it opens a popup. Word of warning about the Repligo PDF app: it doesn’t pre-render the next page while you are on the current one. Every time you flip the page, you get about a second of fuzzy text until it focuses and completes the render. This is quite annoying to see blurry text every single page turn. It actually forces you to slow down or stop reading, interrupting your flow. It looks like ezPDF Reader is still the best paid PDF app for Android. It has so many specific options. You can even change the percentage of screen-swipe that it takes for you to turn the page. Amazing toolbar and annotation options. I highly recommend it. I still love reading PDFs, despite their limitations (I read them solely on my Nexus 7 tablet and 13″ MacBook Pro). I have the old Blackmask Online DVD of 10,000 Classic PDFs, and create my own PDFs from ePub/mobi eBooks using Calibre. There is just something special about a PDF document. Maybe it’s because PDFs were my first experience with eReading back on Windows 95 with “Acrobat Reader 3.0 for PDF version 1.2” 😀 Anyone remember that? If you are planning to purchase a Nexus tablet, go with the Nexus 10. I switched to this about a month after I wrote that earlier comment. The 10.1″ retina display and ezPDF Reader work amazingly well together. On Mobileread Forums, there is a whole topic dedicated to PDFs. A few developers have posted different softwares that can edit and analyze PDFs. I’m not too familiar with any of them, but you could post a question there and someone might be able to help. I downloaded the Es File reader and all the apps I wanted like flash player and youtube. I see them in my Download folder, I just don’t know where to put them so that they show up on my carousel or under the Apps tab. And also how do I get Flash Player to work all the time? Sorry, kinda new to this technology. You just need to tap on the icons from there to prompt the package installer to install them. Thanks for replying! Did what you said and they’re still not showing up. should I erase them and start all over perhaps? I guess I’m not following what the issue is. Are they installing? When I tap on them they prompt for me to install them, after doing so i get a message telling they have installed. But when I go to look for them under my Apps or the carousel they’re not there. Wow. That is weird. The only times I’ve had that happen is when installing an alternate homescreen launcher. I would try a restart and see if that helps, but I don’t know… You can go into the settings menu and pull up the list of apps in manage applications to uninstall them. Like you said, uninstalling and reinstalling may be worth a try too. I tried to download the facebook from the link you have posted. It’s says to go to the amazon store to retrieve it but once i get there it says ” facebook has already been downloaded check your library”, but its not there. What do i do? I’ve encountered that problem with the Kindle Fire in the past. To fix it I had to go to the App section of my Amazon account, then permanently delete the app, and then go re-download it from the Fire directly. Thank you for the very informative and excellent list! Tried to download Dolphin but 1Mobile needs me to download their app to do so and it wants to access all my account information and data. Any other way to put flash on this device without having to install 1Mobile? You don’t have to download their app (I find it excruciatingly annoying personally, to the point where I’m not sure I want to mention their site anymore). They offer the apk download directly from the web page. Just hit the install button and select “to PC” for the apk (they recently changed the layout; it used to be more obvious, now everything leads to a login screen). Just press the FB option, the press back and you’ll have access to the apps! No that’s not right. It was probably from a stupid advertisement link. They make the download links all look similar. Look closely. tried again today nathan . after a few download failed messages it eventually downloaded the youtube apk ,honestly though nathan it was the same link i clicked yesterday, which i think was a download manager,there was a link for a manager as well , dunno why this would happen maybe a popup somehow or something wrong with the sites html,anyway great site iv liked on facebook .quick question cant sign in to youtube app when installed on kindle .do you have a similar problem as its not optimised for fire ? I’ve never been a fan of all the annoying ads at Mediafire. I need to find a way to host apk files myself. And signing in doesn’t work with YouTube because there’s no Google services on the Kindle to finish the process. Me too. I’ll probably put together a rooting guide later this month. They are showing up as apk files right now from my computer. Are you sure it’s not a popup ad that is giving the zip file, because I’ve also experienced that from the Kindle Fire. Or maybe it’s the way Mediafire works by using different downloads? I don’t know how it works but they do something weird if the uploaded file already exists in their database because I’ve had large files upload instantly when they should have taken several minutes. Sometimes with apps they get uploaded as a zip file and then you have to use a file explorer to rename it to an apk file, so maybe that’s what’s going on. Regardless, I do wish I could host the files myself but the only way I know how do so is to change them to zip files, which makes installing them a pain. If anyone knows how to upload apk files with WordPress let me know. I followed the directions from the youtube video on downloading the 1mobile app on my Kindle Fire HD, so that I can then download the Dolphin Browser. It starts to download, and when I check the orange status bar, it only makes it to 97% and then gets stuck there, and I get the message 1mobileMarket_31.apk download unsuccessful. I’ve tried this repeatedly, and I always get the same message. I know that the outside source apps can download, as I was successful in downloading the dropbox app from the dropbox website, and installing it without a problem. Any suggestions as to why this is happening? And do you have any other source you could recommend for downloading the Dolphin Browser? Thanks in advance. You don’t have to download the 1mobile app; there’s a link for the Dolphin apk file to download directly from that webpage. I tried downloading from the link provided in your article above. http://www.1mobile.com/dolphin-browser-79865.html but when I hit the “install” button, it wants me to first download the 1mobile app. Any suggestions? If you select to install via PC it gives the apk download. Hi, I am having trouble with the flash download. I was able to download Dolphin. When I tried the download link for flash, I got a message to click to repair the download. Then, when I tried to open the download, I got a message stating that it can’t open due to a parsing error. I tried it multiple times with the same result. This is not a huge issue for me, I mostly use my Fire as a reader, but I would like the option to use it for games and videos instead of my laptop once in a while. Any suggestions? Thanks, your tips are really helpful overall. Do what I do and use your computer to download the file and then transfer it to the Kindle via Dropbox or email or some other method because these links always work from a desktop computer. I tried to email, use dropbox and transfer via USB, all with the same parsing error. I just saw your blog here. First of all, great work. I think it’s just a max of 250 for free to the cloud, but I don’t use it personally so couldn’t tell you the specifics. I just got my Kindle Fire HD yesterday (I won it! yay!) and I have NO IDEA how to use it. These tips answer all of my questions that I have been having. Thank you so much! can you listen to overdrive audio books on the kindle fire. Regarding video, I’ve just downloaded MX Player (and the supplementary codecs) from the 1Mobile Market without and can now play AVI comfortably I haven’t tried other formats yet). I also tried MoboPlayer but that was laggy. The Overdrive app works for the ePub versions of the ebooks. You’ll need to use the regular Kindle Fire app to read the book if you got the Kindle version, after proceeding through Amazon’s process where you can choose which Kindle to send it to. So I pick the kindle version even if it says not compatible? It will work or do I pick the other one? After converting some home videos to MP4 format and successfully loading them to my wife’s Fire, I find that they all (dozens of them) have no name. Is there a way to apply a file name or icon to the clips so we do not have to guess what we want to view? please help…i had to set up a gmail account on my Kindle Fire for reasons i can’t even remember. Now, i can’t download any apps without going through my gmail account. is there a way to set up and keep communication between my gmail account and google play? i am hating my kindle fire right now because i haven’t had a moment of ease in doing ANYTHING so far! i forgot to mention that when i try to use my gmail account, i get the following message: You need the Google Play Store App in order to download this application. i cannot find the Google Play Store app. HI !! Debbie here again i am trying to download the screen filter 1.2.1 and i cannot seem to be able to even find it i tries going to web and it doesn’t shoe up i searched it on my computer and it comes up no problem ..do i need a different way to get to the internet ? You have to select to install from PC on the other side of that link to get the direct apk download. it doesn’t matter if i have kindle fire HD 8.9 does it ? I am trying to setup the micro HDMI cable from the kindle fire HD to the TV. My question is how do I do this through the Direct TV connection? Just got a Kindle Fire HD and having an issue with free ebooks. When I click on the free ebook nothing happens, it flashes grey to indicate the active link but thats it. Any suggestions? So turning off “acceleration” function under settings, application, silk did the trick. I’m having issues transferring ebooks from my old ebook reader (Aluratek) to my new kindle fire hd.Can you only have amazon books? My camera was working just fine yesterday but when I tried launching it today it’s saying unable to connect. Any suggestions? Follow the steps below and your camera will work fine hopefully. -Slide down the menu from top of your kindle fire in home screen. -Select the last option “More” from the menu. -Select Applications and then installed applications. Select “Clear Data” in camera option. Now start your application and it will work perfect. I downloaded the Youtube apk from your link and installed it. The icon looks horrid, but the actual GUI of the app looks nice. I have not been able to get a single video to play. I haven’t restarted the Fire HD since I installed the app, so I’m going to try that next. I installed Dolphin and Flash and that seems to work 80% of the time. The youtube app hangs up with a loading circle and “You can skip this ad in 5s”. I then have to force close the app to do ANYTHING else. Go figure. Restarting seemed to fix it. Thanks! hey. I was wondering if you could tell me a way to use Bluetooth from my phone to get internet on my KINDLE FIRE HD. I don’t wanna use the hotspot feature because it will cost me an extra $30 on my phone bill. i appreciated your advice re. how to get the kindle fire HD to pair with my droid. Thanks for the great tips. Thanks to you I can now read epub files and play Flash games on my Kindle Fire HD which I didn’t think was possible. Also love the 1Mobile app site. Finally a personal recommendation – I’ve just purchased a Bush Bluetooth speaker from Argos for £20 so I can play music (via Spotify) around the house from the Kindle. I want my Kindle Fire to shut down after 5 minutes of non-use. It is set for that but doesn’t do it. Sometimes in the morning I unplug it and put it into my purse and when I take it out of my purse I discover that the darned thing has been on all day and the battery is nearly dead. I know it comes on when I unplug it, but why won’t it shut down when I’m not using it? How do I fix this problem–actually, how can my husband the computer geek fix it? Tip 41 – install ArkMC and enjoy video stored at your home PC! The new temple run 2 is out really love this game and think others should get it too. Hello. I was wondering how do you change the wallpaper on the kindle fire hd?? Thanks a lot! I think the easiest way would be just to plug both into a computer and transfer them that way. Nathan, thank you for all of your info. I was so excited to get my kindle fire hd as a gift. For me it was an expensive gift and a big deal for me. I received it last Tuesday and Saturday night it was dead and would not turn on. My husband is an IT guy and we did all of the things requested, still no power. I totally freaked out. I contacted amazon and received an immediate response. Kudos to Amazon for such quick customer service. They are sending me a new kindle and it will arrive Tuesday. So, in less than a week I’m on my second kindle. I have now read where there are quite a few people with this same issue. I did not purchse the extended warranty for the kindle, having spent so much money. I hope this isn’t something I have to deal with again. I’m not an IT person at all. So, for me to figure out how to use it and what it is capable of doing, has been rather challenging. Hopefully with help like yours, I’ll figure it out. I visited your blog and I thank it is very interesting. I am in haiti now and I have a 8,9” kindle fire hd. I have 2 question for you. 1) Every time I try to download facebook app, I receive a message telling me that “the settings are not supported by my country. What can I do to solve this problem ? 2) I can’t have google mail on my kindle. I have the “mail app”, it works for yahoo mail but not for gmail. What can I do ? You should try contacting Amazon support because I’ve not experienced either issue. Im getting ready to travel to haiti from the US and wantsd to be sure I could get Wifi on my Kindle fire hd. I tried to purchase international service thriugh At&t but it says that Haiti does not have wifi hot spots. That doesn soun quite right? What do you suggest for service internationally? Hi, I want to buy my hubby a kindle fire for his bday. He has a large list in excel of his music collection , just a list of artists and song names but the file is very large, can this be used on a kindle fire , is there another app which would do the job , or if not what would you recommend and can you transfer the data from our pc, any advice before I buy will be much appreciated. Yeah there are apps that can read office files. If I recall it comes with the free version of OfficeSuite, which can read Excel files. Softmaker Office is a full MS OFFICE-equivalent Android package. It lets you open, edit, and save MS Office files. Or create them from scratch. It has three apps; TEXTMAKER for Word files, PLANMAKER for excel, and SOFTMAKER PRESENTATIONS for Powerpoint. I’ve seen devices on the market that convert HDMI to composite (red, white and yellow plugs)on old analog TV sets. Do you know if this works with a Kindle Fire HD or is this a try it and see situation. I know the picture quality will not be as good, just wondering if it works before buying the converter and HDMI cable. I have no idea if something like that is going to work or not. Great info…I couldn’t quite catch how to get the 22 free audiobooks on the utube video…are they still available and how do I do that? Never mind…..I just figured out how to do it. It walks you through it on the amazon kindle page where there’s a link. about the 3rd party apps can you use the apple appstore??? After removing books from my Kindle Fire HD’s carousel, the books simply reappear. Any ideas on how to fix? Tried a hard shutdown to no avail. Yeah that’s always been an annoying problem with the carousel. As far as I know there isn’t a fix. I inadvertantly checked the box when downloading music that says “save to cloud” or don’t ask again. I picked “don’t ask again” I would really like to have that option back again, is there a way to do it? I really don’t want to restore to original as I like all the other changes I have made. Thank you for any light you can shed on this! I can’t get the video you said you can access on the kindle fire. There is no camera option. Any suggestions? Hi I have a kindle fire hd,and I have a problem.My problem is that one day,my camera was working well,and later i check my pictures and nothing was there, it randomly got deleted,all of my Pictures ! And my camera wont work at all not even to play videos.so please can you help me ?! Hi I just wanted to tell you that kindle fire HD does have a camera…. I didn’t think so either so I also tried to download an app for it, but about two weeks after I got my kindle I was going to my photos and at the top right hand corner was a little camera button and it just seemed to pop up out of nowhere because I had checked before! I got my new Kindle Fire HD and wanted to take some pictures but could not access the camera and was pretty annoyed. I searched amazon app store and came across this app named myCamera HD+, I was happy at least I can take pictures now. Kindle fire does not have a very high res. camera but using some camera apps like these can help you a lot. Wow! This review was seriously fabulous! You just made me fell in love even more with my kindle. Just one quick question, do you know how to install the instagram app? I am a big fan of social media and its kind of annoying to go to silk and log in everytime i want to use instagram. Thanks, your help is highly appreciated. If you tap on the screen to bring up the menu items when reading, there’s a little time indicator in the lower right corner that you can tap to adjust the speed of narration. Thank you, you saved me a major headache. I would put a warning on side-loading any apps. Before doing side-loads, make sure you trust the source. Another option is to make an apk backup of the app you want to side-load on another device, and then transfer to your kindle and install it.